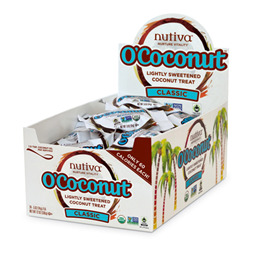 Made from pure, organic coconut, Nutiva`s O` Coconut Classic is a delicious, lightly sweetened treat with no corn, soy or cane sugar. It’s the perfect on-the-go snack with the added benefit of medium chain triglycerides. Nutiva Coconut treats contain 1.5 teaspoons of coconut oil per serving! Nutiva`s coconut products are certified organic and made from fresh coconuts. Nutiva Coconut products come from Southeast Asia, where the coconut oil is processed immediately upon harvesting. The creamy, white meat of the coconut is scooped out of the shell by hand. What you get is simply the creamy, fresh flavour of pure coconut. Nutiva went out looking for the kind of foods that packed a powerful amount of nutrition into every bite so that you could make small changes to big effect. They found superfoods - nutrient-dense powerhouses that can also be grown and processed in a sustainable way. These are foods that are truly good for you and for the planet. They’re organic, full of vital nutrition, easy to use and delicious additions to your diet. Organic tapioca syrup, *Fair Trade organic desiccated coconut, *fair trade organic coconut flour, sweet mix (organic inulin, monk fruit), organic sunflower lecithin, organic coconut flavour, Himalayan sea salt. Nutiva O`Coconut snacks are the perfect treats, which can be enjoyed at any time! 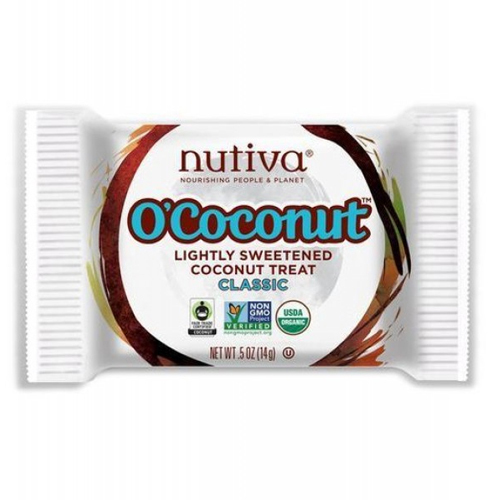 Below are reviews of Nutiva O`Coconut Classic - 24 x 14g Coconut Treats by bodykind customers. If you have tried this product we'd love to hear what you think so please leave a review. Made from pure, organic coconut, Nutiva`s O` Coconut Classic is a delicious lightly sweetened treat with no corn, soy or cane sugar. It’s the perfect on-the-go snack with the added benefit of medium chain triglycerides.